Gua Sha is a natural healing therapy in East Asian Medicine. “Gua” means to scrape and “Sha” refers to the change in color of the skin after the scraping. “Sha” also refers to negative energy or blocked energy in the body that is released with Gua Sha. 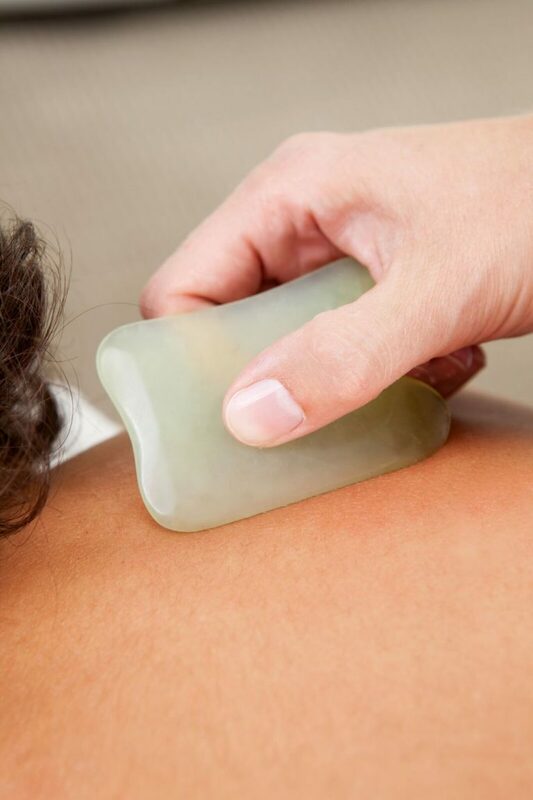 Gua Sha is done with a rounded edge tool that is traditionally made out of Jade. Other tools include a Chinese Soup spoon made out of ceramic or tools made out of Ox bone. To begin gua sha therapy, oil is rubbed into the area of the skin that is going to be treated and the practitioner then uses one of the instruments mentioned above to perform short, long, quick strokes in a downward motion on the body. This allows Qi and blood to flow to the affected area while decreasing inflammation and softening the tissue. Gua Sha stimulates the immune response in the body to bruising or broken blood vessels indicating to the body that it is time to start the healing process. Bruising, petechiae, and redness all can occur with Gua Sha, but any markings from the Gua Sha typically dissipate in 2-4 days. Common areas of the body that receive Gua Sha are the back, neck, arms and legs. Another area that is becoming more popular is the face for facial rejuvenation. Light, long strokes are applied to the face with gentle scraping along the lines/wrinkles in the face to promote Qi and blood flow to those areas in order to reduce the lines/wrinkles in the face along with inflammation. Pain Acute or Chronic that includes: knee, back, neck, shoulder, elbow, and more. Injury to the skin such as sunburn, rashes, abrasions, bruising, ulceration, and lesions. Bleeding disorders such as leukemia, anemia, and thrombocytopenia. Blood thinning medication such as Coumadin. Trauma to the body including acute injuries of the muscle, tendons and any bone fractures. Areas that have malignant tumors or masses. Severe acute cardiovascular or cerebrovascular diseases. On the lower abdomen in women that are pregnant or menstruating. Gua Sha is an East Asian Therapy within the scope of a licensed Acupuncturist, who are formally trained to administer this type of therapy. It should not be painful when correctly administered for about 10 minutes to a particular area of the body or until the Sha surfaces with petechiae. It is important to note that other practitioners such as physical therapists and massage therapists are now offering this service to their patients, but any professional offering this treatment should have a Gua Sha certification or be a licensed Acupuncturist.